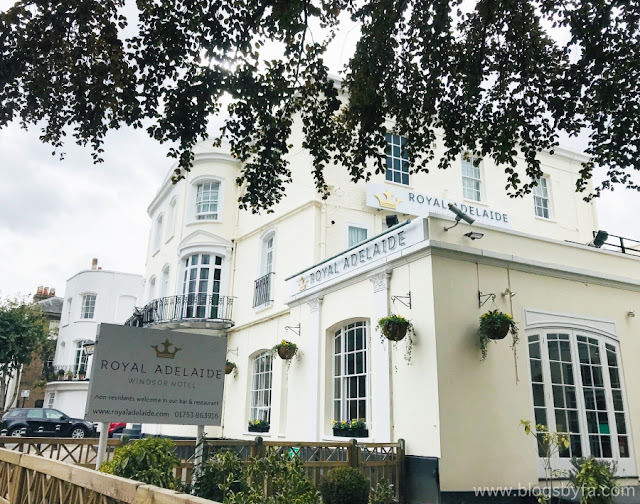 The Royal Adelaide Hotel in Windsor is an elegant Georgian building with an impressive original exterior and large sash windows. Located opposite The Long Walk towards Windsor Castle, the hotel is only minutes from plenty of shops, restaurants and galleries of Windsor and Eton. A perfect location to choose when visiting Windsor and looking for a place to stay. The property has a paid, gated car park for the hotel guests and that's where we left ours before checking-in. If you would need to use their car park it's better to book a space prior to the visit to avoid disappointment. Hotel car park is available only for the guests and the charge per night per car is £15. We were politely greeted by the receptionist and after a very smooth check-in, we decided to to unwind for a bit before heading to the hotel's restaurant for dinner. 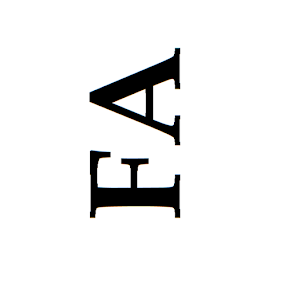 Although the hotel does not have a lift, the staff is available to help with the luggage if required. It took no time for me to discover the hotel facilities that include telephone, free WiFi, complimentary toiletries, laundry and dry cleaning service, ironing board, safe deposit inside the room, TV & Radio, hair dryer and travel cots available on request. Its always lovely to know about the availability of complimentary toiletries as that really helps in reducing the luggage. The Royal Adelaide Windsor Hotel provides shampoo, conditioner and shower gel - the products had a lovely fragrance and BabyN' enjoyed his bath thoroughly while playing with the bubbles. 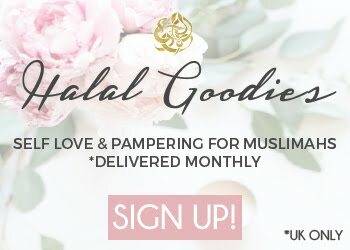 Other items such as razor and shaving cream, toothbrushes and toothpaste, body lotion and sewing kit can be obtained free of cost from the reception. Sanitary napkins are also available via a vending machine in the ladies toilet. Soon after BabyN' finished his bath, we headed to the hotel's restaurant for dinner. Guests can enjoy a stylish lounge and bar as well as a brasserie, serving freshly prepared cuisine using fine seasonal produce and an excellent selection of Moroccan influenced dishes such as homemade humus and lamb tagine. We started with the Soup of the Day (£4.95) served with bread, and Salmon Fish Cake (£7) that was served with celeriac and cabbage remoulade. I really liked the fish cake and it was one of the best I've ever eaten. The soup tasted good too. Husband and I finished our starters soon ready to welcome our mains. We had opted for Crispy Skin Sea Bass (£14.50) and Smoked Haddock (£12.50). The first main was served with spring vegetables and creamed lemon sauce. The fish had been cooked well and the light tinge of lemon in the sauce complimented well, while the haddock was served with spinach, mash and pochard egg in a white sauce. It was quite appetising and I managed to finish all of it. The restaurant offered to serve a cheese and tomato pizza for BabyN' and we also ordered some fries (£2) to go along with that. Although he wasn't too keen to finish it at the restaurant, but really enjoyed eating it later before going to bed. For the dessert, we just opted for 3 scoops of ice cream - chocolate, vanilla and strawberry which was perfect to end the meal and retire for the night. The king-size double bed in our Superior Room with twin beds joined together was perfect for all three of us to share the bed - the super comfy brand new HYPNOS bed and mattress was 150cm wide and was brilliant for a good night's sleep. Also, the Royal Adelaide is a pet friendly hotel in Windsor, so you won't have to leave behind you fury friend if you want to bring it along. On weekends, full English hot breakfast is served between 8:00 am - 10:30 am (Mon - Fri 7:30 - 9:30). In addition, the buffet has a variety of juices, cereals, fruit yogurt, milk and freshly baked items. I ordered a Vegetarian English breakfast for myself that included scrambled eggs, baked beans, mushrooms, tomato, a hash brown and 2 vegetarian sausages. Those sausages tasted great, and had been cooked using potatoes. The guests get a choice of eggs to to choose from - scrambled, poached or boiled I think. The other hot breakfast plate for the husband was almost the same, with the addition of salmon and excluding baked beans and sausages. The breakfast was fantastic and was perfect to get us ready to explore Windsor! 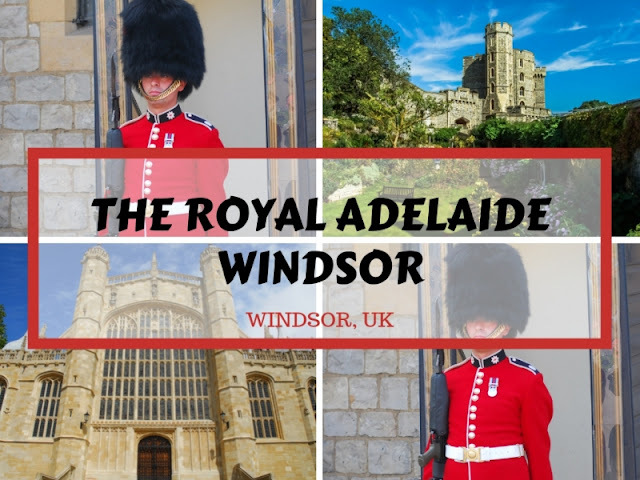 Windsor Castle, St George's Chapel & Changing of the Guard - It is not possible for anyone visiting Windsor to miss the Windsor Castle, a royal residence located in Windsor which is associated with the British Royal family. It is the oldest and the largest occupied castle in the world, and was founded in the 11th century by William the Conqueror. Check out the changing of the guard schedule prior to the visit to ensure you have the right information. This does not take place everyday, and never on a Sunday. 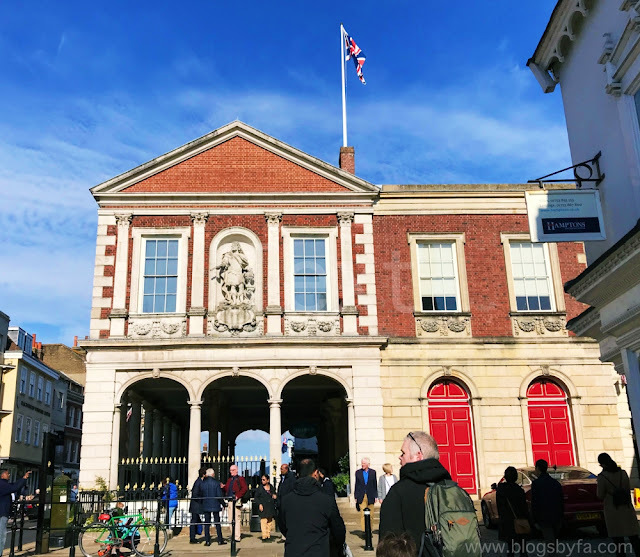 Generally it begins at 10:40 am and to catch the best views, wait on the Guildhall steps on High Street or between the statue of Queen Victoria and the Castle entrance on Castle Hill. Entry to the Windsor Castle is charged and tickets can be purchased from the entrance. The entry also enables visitors to see the but as informed by one of the lady working for the Windsor Castle, St. George's Chapel is only open for service (Evensong at 5:15 pm) and there is no charge for attending the service. St George's Chapel is located inside the Windsor Castle and has been designed in the high-medieval Gothic style. It can accommodate almost 800 people and is located in the lower ward of the castle. Visitors wanting to enter the St. George's Chapel other than for services, have to go through the Windsor Castle ticket office. This tourist trap is very busy in the morning and long queues can be seen, so its best to visit after midday. Ticket price for the entry to the Windsor castle is £21.20 per adult while children under 5 enter free. The Diamond Jubilee Fountain - Inspired by the crown jewels, this fountain has been opened at the Goswells Park to mark the Queen's Diamond Jubilee. The fountain is 25m long and also has a circular pool. The middle of the pool represents a crown that has 60 water jets. There are a few benches for visitors to sit and relax while the kids runs around and enjoy the water sprinkling on their face. 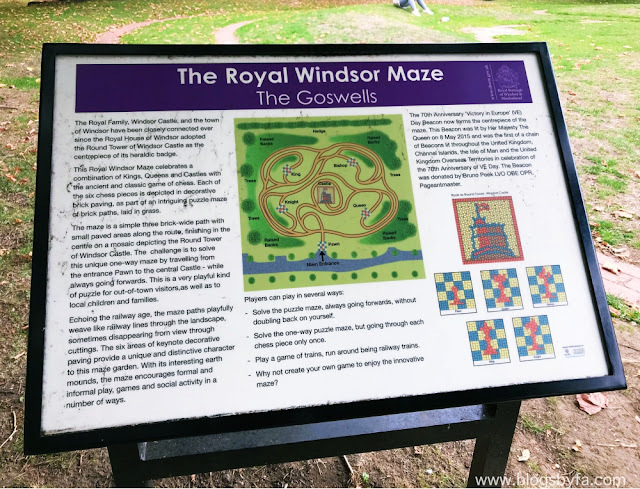 Royal Windsor Maze - The maze has been created inside the Goswells Park and has been aimed at the children to enable them to run around and enjoy the outdoor activity. Alexandra Gardens - Go for a stroll in this pretty public garden located near the River Thames. The gardens have seating, a bandstand and lots of space for picnics. The Hawker Hurricane - This is a British single-seat fighter aircraft of the 1930s–1940s which was designed and predominantly built by Hawker Aircraft Ltd. for service with the Royal Air Force. Thames Walk - The walk heads to open fields alongside the Thames and the Windsor Racecourse. It's always lovely going out on a walk especially on a bright sunny day, so why not enjoy the views while walking. 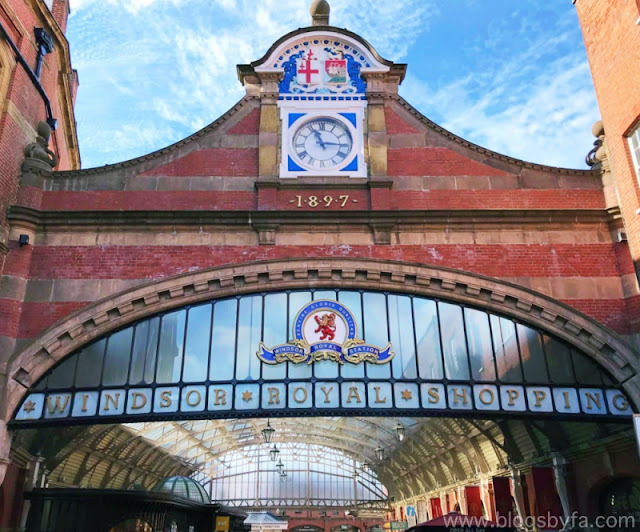 Windsor Royal Shopping - Located just opposite the Windsor Castle, inside the Grade II listed Victorian railway station, the Windsor Royal Shopping is a great shopping destination. Shoppers get to see most of the original features such as the Jubilee Arch, the cobbled stones as well as Queen Victoria's waiting room. There are not just over 40 shops, but restaurants, cafes and bars as well as the art and craft open market attracts a lot of tourists. Eton College Natural History Museum - This museum in Windsor can be one of the best places for children but it opens for public only on Sundays between 2:30 pm till 5:00 pm. The museum is free to enter. 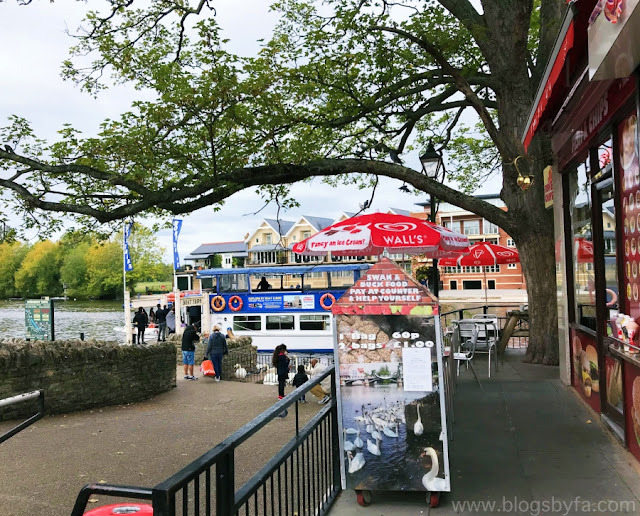 Feed the Ducks & Enjoy a Boat Trip in Windsor - Visitors can purchase swan food from the shops or from the nearby stalls and spend some time feeding the swans and the ducks before enjoying a river boat trip. The options include a daily 2 hour return trip or a 40 minute return trip and fares of these trips organised by Frenchbrothers vary on weekends and on weekdays. It looks like you had a lovely time away! The hotel is absolutely gorgeous and I LOVE a HYPNOS bed. Thanks for also sharing your top things to do in Windsor, I've only been when I was a kid to see the castle with my parents and I really want to go back. What a lovely look place to stay while in Windsor, I have to admit I have never been myself, but I would love to go and explore myself I have to say. The boat trip sounds lovely and I mean you couldn't not go and see the castle. One day I'm going to make a trip across the pond and when I do,I want to stay in a hotel like the Royal Adelaide Hotel.....what a beautiful building!! I think you can always tell a good hotel by their breakfast and this one looks so good!